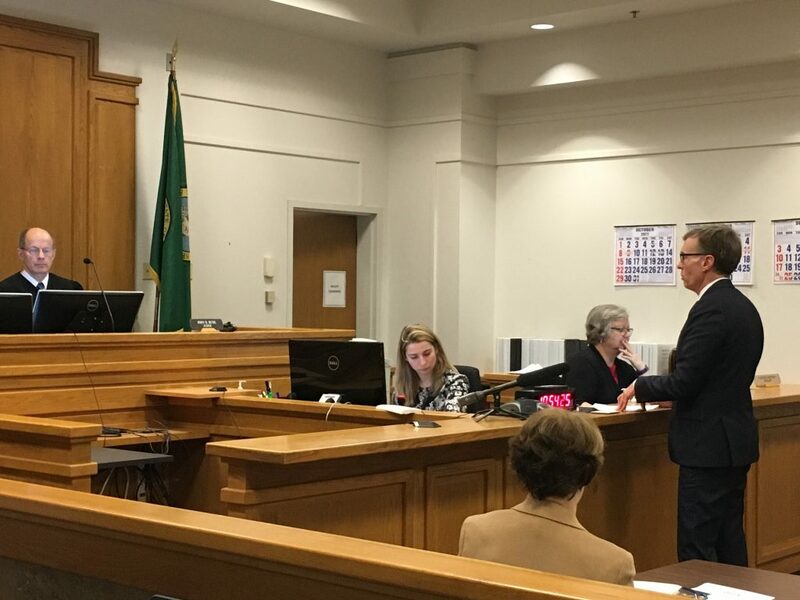 This morning King County Superior Court Judge John Ruhl held a hearing in the case challenging the City of Seattle’s income tax on annual income over $250,000. And it was a protracted, two-and-a-half hour affair. Multiple suits challenging the law have been consolidated into a single case, which means that there are several plaintiffs — all filing briefs and wanting time to present their case at the hearing. There are also high-profile “amicus” parties, including the Rental Housing Association (on behalf of the plaintiffs) and the Economic Opportunity Institute on behalf of the city. All told, there are over 1200 pages of legal briefs on the issues in the case, and there will be far more by the time it inevitably makes it to the state Supreme Court. Ruhl declined to rule from the bench this morning, preferring instead to take a more thorough approach to the issues raised and issue a written ruling in the next couple of weeks. RCW 36.65.030 states that cities may not impose a tax on net income; Seattle’s tax is a tax on net income, and so must be found invalid (since state law pre-empts local laws). The state Supreme Court has previously ruled that an income tax is a tax on property. The state Constitution requires all property taxes to be uniform upon a class of property (e.g. income), so a graduated tax scheme that only imposes taxes on income above a certain threshold is unconstitutional. There are a few other issues tossed in for good measure, but these are the two central ones that will be decisive. There is a principle of jurisprudence that says that a court should attempt to decide a case without reaching for constitutional issues if it can possibly do so. Here that means that the court will consider the issue of RCW 36.65.030 first, and if it finds that the city’s income tax is an impermissible tax on net income, the case stops there. But if the city overcomes that hurdle, the court will need to look at the constitutional issue as well. The Seattle tax is a tax on total income, not net income. RCW 35.63.030 was unconstitutionally enacted, because the 1984 bill that enacted it into law violated the rules for bill construction: it contained multiple topics, not all of the components had “rational unity” with the bill’s title, and not all of the components had “rational unity” with each other. The argument over whether it a tax on net income centers on line 22 on IRS form 1040, which the city’s income tax ordinance uses as the taxpayer’s taxable income. Line 22 is listed as “total income.” However, it is the sum of several components (wages, investment income, business income, etc. ), many of which allow for specific types of deductions before line 22 is calculated. The city made the argument today that even if there is some netting happening in the calculation of “total income,” line 22 is not net income. It’s a pretty tortured argument; for example, they claimed there is a distinction to be made between “business income” and “personal income,” even when the business is a sole proprietorship, so that the business income component of line 22 could be “net income” and line 22 could still be “total income.” The plaintiffs responded that there is no legal basis for separating the business income of a sole proprietorship from the rest of a person’s income, and indeed that is the intent of a sole proprietorship. Largely this debate is about the definition of “net income,” which RCW 36.65.030 unfortunately doesn’t define, and Ruhl will need to decide. The question of whether RCW 36.65.030 was constitutionally enacted requires going back to its legislative history in 1984 and beyond. Apparently in the early 1980’s many jurisdictions were looking at a hybrid form of “city-county” government. The Washington State Constitution allowed for this (article XI section 16), but state law said little about how such a thing might work. Thus was born SSB 4313, a bill creating a new section of state law filling in the blanks of how a combined city-county would operate. Title 35 of the Revised Code of Washington is the set of laws applying to cities and towns; Title 36 is the equivalent for counties. SSB inserted a new chapter into Title 36 — the one for counties. A county, city, or city-county shall not levy a tax on net income. Certainly on its face, that seems out-of-place; it applies to all cities and counties, not just hybrid city-counties. And it’s buried in Title 36 on counties, so if you read Title 35 on cities looking for laws on income taxes, you would never find it. The Washington State Constitution says explicitly that a legislative bill may only be on one topic, and that topic must be expressed in the title of the bill. In this case, the bill’s title was “A law pertaining to local government.” It’s very broad and general, which is allowable if and only if every part of the bill has “rational unity” with that title and “rational unity” with every other part of the bill so that it’s a consistent whole. You can see the argument for why a single line banning income taxes within all cities, counties and city-counties does not have rational unity with the rest of the bill. Every such city-county shall have and enjoy all rights, powers and privileges asserted in its charter, and in addition thereto, such rights, powers and privileges as may be granted to it, or to any city or county or class or classes of cities and counties. That means that in order to restrict a city-county from imposing an income tax, they needed to put the same restriction on cities and counties. And thus they arrived at a broad-brush restriction on income tax embedded into a bill on city-county government. Will Ruhl find that explanation plausible? We’ll see. If he finds for the city and throws out 36.65.030, then he must go on to address the second issue: whether a graduated income tax is consistent with the state Constitution That’s a question with an equally messy legal history going back almost 85 years. The power of taxation shall never be suspended, surrendered or contracted away. All taxes shall be uniform upon the same class of property within the territorial limits of the authority levying the tax and shall be levied and collected for public purposes only. The word “property” as used herein shall mean and include everything, whether tangible or intangible, subject to ownership. All taxes shall be uniform upon the same class of property. Second, in 1933 the voters approved an initiative establishing a graduated income tax. That initiative was challenged in court, in Culliton vs. Chase. The Washington Supreme Court ruled that the initiative was invalid; in doing so they noted that Aberdeen vs Chase had established that income was property, and they pointed to the recently-enacted Amendment 14 which required taxation to be uniform (i.e. no graduated rates). It has been definitely decided in this state that an income tax is a property tax, which should set the question at rest here. Aberdeen Savings Loan Assn. v. Chase, 157 Wash. 351,289 P. 536, 71 A.L.R. 232. Even though some of us dissented from the majority decision, the dissenting opinions show that the case was thoroughly considered, and the opinion of the majority should govern. In future cases, even a dissenting justice should be bound by the decision of the majority until and unless authoritatively overruled or reversed by some higher tribunal, such as the supreme court of the United States. It is asserted that a state income tax is an excise tax. That is not correct. The cases cited to sustain the assertions all involved corporate franchise tax laws and the like. It’s worth pointing out that Aberdeen and Culliton were only three years apart, and many of the Supreme Court justices took part in both rulings. One would expect that they would have a clear understanding of what the Aberdeen ruling actually said, since they had a hand in writing it. Since the Culliton ruling, the U.S. Supreme Court has made several rulings on the question of whether income is property, as have several other state Supreme Courts, but the Washington State Supreme Court has not made any subsequent rulings. Coming back to today’s case, the City of Seattle argues that the Culliton opinion is wrong, and Aberdeen did not, in fact, rule that income is property. They go on to make an impassioned case for why the city’s income tax should be properly thought of as an excise tax on “the privilege of living in Seattle,” not a property tax. The tax is measured on an individual’s income, but it is not a tax on income. itself. They argue that “income” is a transaction, not intangible property, and thus properly subject to an excise tax on that transaction. To support their argument, they note that property is taxed every year, whereas income is only taxed once. That probably isn’t going to pass muster. It says nothing about the tax being on the privilege of living in the City of Seattle. Plaintiffs hammered that point home today, arguing that the City was revising their rationale after-the-fact to try to make it look legal. Nevertheless, it’s very unlikely that the Judge Ruhl will wade this far into the argument of whether income is property. That is because lower courts are held to the principle of stare decisis, requiring them to abide by prior precedent of their own court or a higher court directly above them in the appeals process. In this case, there is clear Washington Supreme Court case law holding that income is property, and as such a graduated income tax is unconstitutional. Judge Ruhl must defer to that under “vertical stare decisis.” But once the case reaches the state Supreme Court, then the rule becomes “horizontal stare decisis,” which allows for a court to overturn its own prior decision if it finds it was clearly in error or if legislative or legal activities since the original case make the earlier precedent no longer current or relevant. Ruhl can’t overturn Culliton, but the city hopes that the State Supreme Court will do so and rule that income is not property (and an income tax is not a property tax). Even if the city wins on both of these questions, it’s still not quite out of the woods. Even if income isn’t property, that doesn’t mean that the city has authority to tax it; the state needs to explicitly give the city that authority. State law gives cities fairly broad authority to levy taxes as necessary to provide for the proper functioning of government and city services, but it’s not unlimited authority. The plaintiffs have already put forth the argument that Seattle doesn’t have an explicit grant of taxing authority on income; the city disagrees, but that will need to be argued out as well. When Judge Ruhl issues his opinion in the next couple of weeks, expect him to spend the majority of his time on the question of RCW 36.65.030 and whether Seattle is taxing “net income.” Whichever way he rules, it will immediately be appealed and the case will start its inevitable climb up to the state Supreme Court. But since parties in a case are not allowed to make new arguments on appeal that they didn’t introduce at the lower court, every issue they might raise later must be brought before Ruhl now. Thus: 1200 pages of briefs, a preview of what they intend to argue before the state Supreme Court. You can find a collection of legal briefs related to the case here.